The clock said 9:30 a.m. when my wife set the coffee on the nightstand and said, “You’re burning daylight, hoss.” So much for the early start. I was mounted up and rolling west out of Portland by half-past ten. It was starting to get warm, but there was a breeze and the stifling humidity of Saturday was gone. My destination was map 10 in my hen-scratched 1994 Delorme Gazetteer. I often browse it like a bedtime story before turning out the lights, hoping to dream of the road. A few weeks ago I noticed how Routes 5 and 93, along with the Waterford and Sweden Roads, form a loop around Lovell. In the middle are some tangled dirt roads, Kezar Gorge and Sabattus Mountain. It looked like prime frolicking grounds for my Russian sidecar motorcycle. First, I stopped at my Old Man’s house in Buxton to say hello. After getting an earful of family and neighborhood news, I kept going west. I rode the length of Buxton into Standish, passing my alma mater Bonny Eagle High School. I noticed one of the football goal posts was twisted and laying on the ground. When I went to school there, we didn’t have football team and that was the soccer field. But that’s a different story. I hit Route 25 and took it west into Limington, over the Saco River rips. Then, I turned right onto Route 11 at Jongerden’s store. This brought me over another bridge at Steep Falls and back into Standish. I pulled into the parking area on the far bank. Like seemingly all river towns in Southern Maine, this one used to have a mill. It had several. The last one, according to steepfalls.com, burned in November 1925. It was the Androscoggin Pulp Mill (though it was on the Saco River). I don’t think it was a going concern at the time, but at its peak sometime in the teens, it employed 80-or-so souls. It had a railroad spur running right up to it and logs were floated down from upriver. 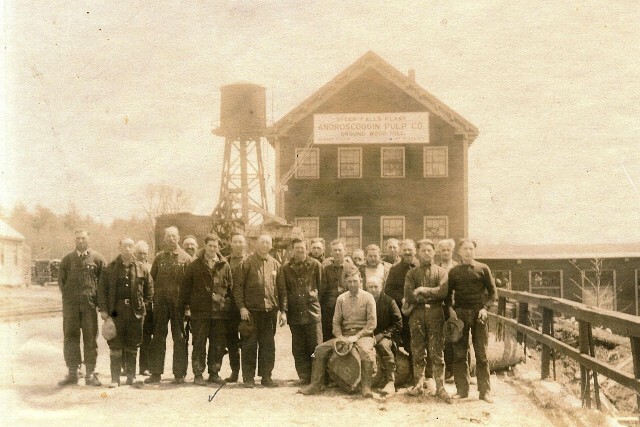 Androscoggin Pulp Mill on the Saco River in Steep Falls back in the day. The bridge was bult in 1937, which would have been a year after the big spring flood of 1936 when all the bridges on the Saco between Buxton, Hollis, Standish and Limington were washed away. From the bridge, I could see folks wading in the river at a sandy bit a quarter mile away. By now it was noon and I was feeling the heat under my leather jacket, gloves, boots and (safety first) helmet. A dip in the Saco would feel great. Of course, I didn’t have my swimming costume with me. Dang. I made a mental: if it was still light out on my way home I’d chance skinny dipping. Growing up near the river in Buxton, I’d swum in it a lot, but never here at Steep Falls. I pulled away on my green bike without even wetting a toe. I followed Route 11 to 107 and then to Bridgton. (By the way, Route 107 is one of my favorite winding, shady motorcycle routes.) In Bridgton, the town where my father was born, I stopped at Ricky’s Diner where I’ve had many a wonderful midday breakfasts. It was chock full of people at 1 p.m. snarfing down piles of food at the retro chrome and formica tables. The wait staff, all dressed in semi-matching turquoise T-shirts, buzzed about filling orders. Somehow, I resisted the two-foot tall letters on the plate glass window shouting about their all day breakfast menu. I ordered barbecue chicken quesadillas instead, as I moseyed up to the counter. What I got was perfectly edible: cubed chicken bits in barbecue sauce with melted cheddar cheese between a toasted tortilla, garnished with a saucer of salsa and a plastic cup of sour cream. I ate it and it was fine, but it was not homefries, toast and eggs. I’m just sayin’. Mental note: when in a diner, order diner food, dummy. From there, I took the horrendously bumpy Route 93 to Sweden. It was rough enough to be considered a battlement should Bridgton ever try to invade. I think I lost three fillings on the way. I’ve ridden over cobblestone streets in Portland that were smoother. At a sharp bend, I turned right on the Waterford Road, which turns into the Sweden Road when you cross into Waterford. At least it does on my early 1990’s map. I took a series of dirt track lefts, trying to find my way into the interior, towards the gorge, but they all dead ended in the woods. I eventually hit Route 35 and rode to North Waterford and turned left onto Five Kezars Road by the fairgrounds. It started out paved but turned to dirt (yay!) before long. It skirted a pond or two where I could see fishermen. The tree cover was dense and leaf-dappled beams of sun danced all around. After only a couple of miles of smooth going I saw a turnoff with cars. I pulled in. I could hear the rushing water. Or was it the sound of millions of tiny mosquito wings beating in anticipation of fresh blood? They attacked in formations of five or six at a time. My exposed arms and neck were soon riddled with signs of war. I tried to keep moving, down the bank to the gorge. Anyone watching me from a distance, while I took a look at the upper sluice, might have thought I was unhinged as I walked in concentric circles, waving my arms and hitting myself about the cheeks and neck. By the way, getting good pictures and video is hard when you’re moving and being munched on by the Devil’s favorite insects. Mental note: put large bottle of bug dope in the sidecar for future adventures. The dirt road went on for several more miles though the woods. It was pleasant. It came out on Route 5 near Center Lovell. I turned right and made for the Sabattus Road. It led up the foot of Sabattus Mountain, to a little parking area. I put my motorcycling gear in the trunk and strapped on a belt pack with a couple liters of water and slung a camera over my shoulder. I chose the right spur of the 1.4 mile loop trail to the summit. The trail rises about 600 feet to the top and the trip to the top took me just over a half hour, with a couple of breathers for pictures and video. The path went pretty much straight up, through ferns, pine and hemlock. The short climb was rewarded with spectacular southwest views. I mean, it was great and really unexpected. The open ledge drops right off, so be careful if you ever take the hike. Keep your children and pets leashed. I admired the view, enjoyed the breeze and refreshing lack of mosquitos. I sipped, then chugged my water, wiping my beard with the back of my hand. I met an older couple with tanned skin and sun hats. They said they hike to the top at least twice a year. The trip down made my knees a little wobbly though it was a gentler, more meandering trail. The parking area was empty when I got there. I suited up once more and made for Portland via Routes 37, 117, 107 and 114. I made it home before dark. I forgot to go back by Steep Falls. Skinny dipping in the Saco would have to wait for another day. I’m sure local residents were relieved. Mental note: pack swim shorts next time, and make sure next time is soon.